Midland Farms provides unique business to business solutions within the dairy industry. We strive to accommodate our customers with private labeling, bulk orders, customized customer service, and packaging options. Our customers have the option to use their own custom designed label in the processing of their purchased products through Midland Farms. This allows for brand recognition and brand awareness. Midland Farms offers the following bulk options: 5 gallon bags, 300 gallon totes, and full tanker loads up to 8,000 gallons. Cheese, yogurts, and other dairy products are processed with bulk orders from Midland Farms. Midland Farms customer service provides special attention to requests to better satisfy customer needs. Our customer service department will work with you to exceed expectations for each delivery. 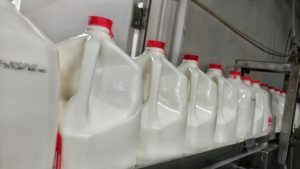 Midland Farms offers the choice to receive milk bottles and cartons in plastic cases or corrugated boxes at the customer’s request.